Fishing is one of the oldest industries in Cornwall. From places such as Newlyn, Padstow, Looe and Fowey fishing has been at the forefront of Cornish culture. Trips are available from nearly every seaside town and village, with some of the most experienced skippers in the world ready to welcome you aboard their boats. Below are just a couple of suggestions of places to visit, whether you're looking for sea fishing or lake/river fishing, you'll find somewhere to suit your needs. 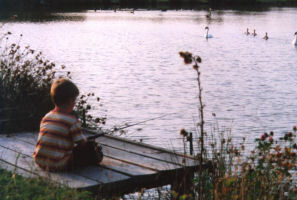 Bake Lakes - These excellent fishing lakes, which offer fly and coarse fishing, are only 2 miles from St. Germans. It is hard to imagine anywhere in Cornwall offering a better combination of a place to stay with fishing. Transport to and from the lakes is available. There are seven lakes set in 30 picturesque acres at Bake Fishing Lakes. Located just off the A38 at Trerulefoot in the beautiful Cornish countryside near Looe. 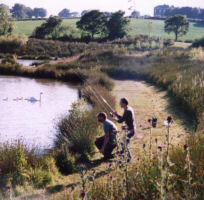 There are 5 lakes offering general coarse fishing, a specimen coarse lake and one large trout lake 5 acres in area. Contact: Ian Spencer - tel: 07798 585836 or 01503 263349. There are many places along the coast around that are good for fishing, but it is very important to keep an eye on the tide and be wary that rogue waves can be very dangerous. In Looe you may find a visit to Looe Chandlery tel: 01503 264355 - a good place to glean tips. There are a number of fishermen offering trips - try Fishing Cornwall tel: 07853 391090, Typhoon Fishing Trips tel: 01503 264610, or friendly skipper Steve Brenchley of MeerKat Fishing Trips tel: 07866 230368 or 01503 263043. Alternatively from St Germans you can head across the border to Plymouth (20 minutes by train) to talk to the friendly staff of Plymouth Angling on 01752 361294 for local gen. Boat trips can be booked through Plymouth Boat Trips, tel: 01752 253153 or 07971 208 381. Fishing on the beach and off the harbour is a possiblity in Hayle - the first port of call for information should be the newly opened Angler’s Den en route to the beach, tel: 07733 272524. Only two miles from Hayle is BK Fisheries tel: 01736 753275 and 07919 130244, set in 15 acres of beautiful, tranquil Cornish countryside bordered by the river Hayle. The Fishery has good road and train links from St. Ives, Penzance and Hayle areas and is only 1.5 miles from the A30. 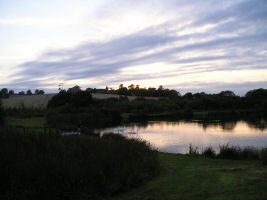 The fishery is owned by angling entrepreneur Billy Knott. 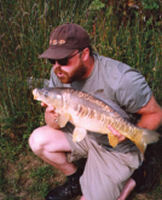 Billy has been involved in the angling industry for over 30 years. For trout fishing, Tree Meadow Trout Fishing tel: 01736 850899, offers four and a half acres of gin clear spring fed water set in wooded valley established 1989. 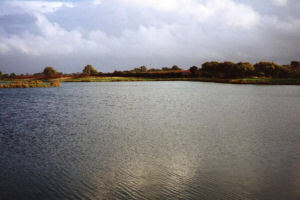 It is a Troutmaster Water regarded as Cornwall’s premier large fish fishery. 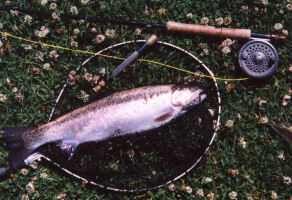 The fishery proudly holds the Cornish Rainbow Trout record of 22lb 4oz. "Pretty much all of the coastline around falmouth is good for fishing, but avoid the beaches when busy in summer. Castle beach, Pendennis point, Custom House Quay and the Prince of Wales pier are all within easy walking distance of the Falmouth docks rail station. Penryn river is about 1/2 mile walk from the rail station, can be good fishing on a full tide. Also, the Tackle Box - Art of Fishing, tel: 01326 315849, on Swanpool street, is an excellent place to visit to get the latest fishing information from the area, bait, tackle, charter booking details and information about local fishing marks."